The terrorist attacks in New York, Washington DC, and Pennsylvania on September 11, 2001 touched people worldwide, and cartoonists have turned to art to express their grief and support. 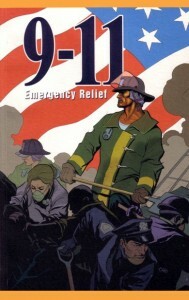 9-11: Emergency Relief is a comic book project to benefit the American Red Cross featuring some of the comic world’s leading talents. From legendary creators such as Will Eisner and Harvey Pekar to new talents on the cutting edge of the comics medium such as James Kochalka and cover artist Frank Cho, over 80 cartoonists from all areas of the cartooning world have joined together in this community effort. Released January 2002 from Alternative Comics, 9-11: Emergency Relief is a collection of these cartoonists’ personal non-fiction accounts of their experiences related to the tragedy. The American Red Cross name is used with permission of the American Red Cross and does not constitute an endorsement, express or implied, of this book. 100% of the net proceeds from the sale of this book will be donated to the American Red Cross to support its lifesaving relief efforts in communities everyday.